If you have a reservation at Chef Mickey’s in late July or early August please be advised that the character meal will be temporarily relocating to the Contemporary Resort’s Convention Center. The unplanned maintenance is expected to begin on July 28 through to August 13 2017. During this time, the character dining buffet will relocate to the convention center at Disney’s Contemporary Resort. Guests with reservations are being contacted to made aware of the relocation. If you’re a Star Wars fan and have visited Disney’s Hollywood Studios you know that the Force is strong there. This week marks the return of “Star Wars: A Galaxy Far, Far Away” after a brief hiatus. This show, presented several times daily in the park’s Center Stage area, brings to life iconic moments from the Star Wars saga with compelling film clips and appearances by favorite Star Wars characters from Darth Vader to Chewbacca. “Star Wars: A Galaxy Far, Far Away” celebrates our love of all things Star Wars with unforgettable memories from the entire galactic saga. Now, Rey has officially joined the lineup, appearing on stage alongside lovable Resistance droid BB-8 and clenching a lightsaber in her outstretched arm, just as she did at the conclusion of Star Wars: The Force Awakens. The incomparable nighttime show “Star Wars: A Galactic Spectacular” was also recently updated, incorporating sequences from Rogue One: A Star Wars Story that put you right in the middle of thrilling moments from the movie. It’s clear that more than ever, Disney’s Hollywood Studios is the place where Star Wars lives! As a part of Holidays Around the World at Epcot, the Candlelight Processional presents the traditional story of Christmas in truly spectacular fashion – with a celebrity narrator, a 50-piece orchestra and a mass choir. Newcomers to the celebrity narrator spotlight this year include Daytime Television Legend Pat Sajak and TV star CCH Pounder, who was recently at Disney’s Animal Kingdom for the Grand Opening of Pandora – The World of Avatar. Returning favorites include television, film and stage superstar Neil Patrick Harris, country megastar Trace Adkins and Contemporary Christian music artist Jaci Velasquez. The processional is performed three times per night (5:00, 6:45 and 8:15 p.m.) during the holiday season at the America Gardens Theatre. These packages, available on select nights, include a delicious meal and a guaranteed seat for one of the Candlelight Processional performances. Availability is limited. As with last year, in addition to lunch and dinner packages, breakfast options are available at some favorite restaurants in and near Epcot again this year like Akershus Royal Banquet Hall and The Garden Grill. Breakfast, lunch and dinner options are also available this year at Captain’s Grille at Disney’s Yacht Club Resort, with breakfast and dinner options being offered at Trattoria Al Forno at Disney’s BoardWalk. Candlelight Dining Packages for breakfast start at $35 plus tax per person for adults and $21 plus tax per person for children, ages 3-9. Candlelight Dining Packages for lunch and dinner start at $44 plus tax per person for adults and $15.50 plus tax per person for children, ages 3-9. Holidays Around the World is an extravaganza of holiday entertainment, merchandise, food, beverages and festivities where guests can celebrate at Epcot throughout the holiday season. Time-honored traditions come alive through the sights and sounds of the countries of World Showcase, and live performances enliven the park throughout the day. Click here to book Candlelight Processional dining packages or to find out more information, call 407/ WDW-DINE (407-939-3463). Holidays Around the World, including the Candlelight Processional, runs November 24 – December 30, 2017 at Epcot. Keep checking the Disney Parks Blog for updates. When Pirates of the Caribbean re-opens at Disneyland Paris on July 24, guests will discover new surprises as well as a band of new buccaneers. 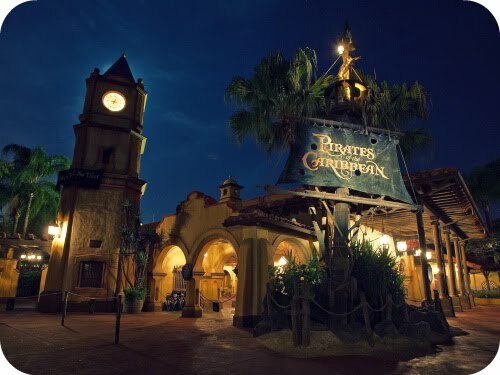 The blockbuster “Pirates of the Caribbean” films provided the inspiration for Disney’s Imagineering team to come up with new twists and turns in our story, and a chance to introduce new characters and magic to this classic attraction. Throughout the attraction, Disney has enhanced the show with new Audio-Animatronics figures, costumes, special effects, lighting and sound, including some of the now-classic musical themes from the films. Of course, the classic “A Pirates Life for Me!” song will continue to underscore the attraction. Guest will even discover that a familiar character is playing a new role joining the pirates ranks and helping the local townspeople “unload” their valuables at the Mercado auction. 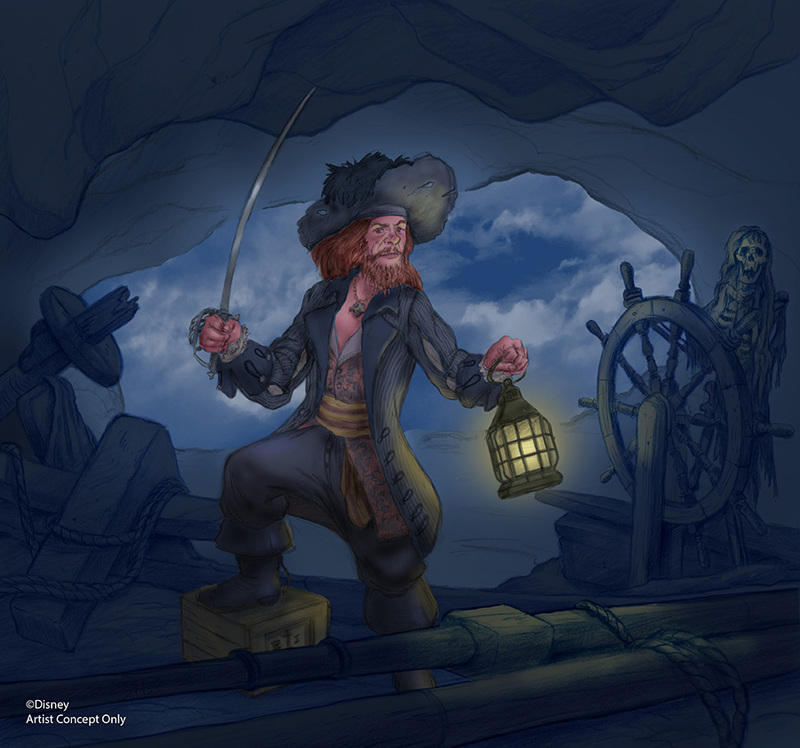 On this side of the pond, at Magic Kingdom park and Disneyland park, it’s a pirate’s life for a favorite redhead—beginning in 2018, after an already-planned refurbishment, the redhead is trading her fashionable bonnet for a pirate’s hat. 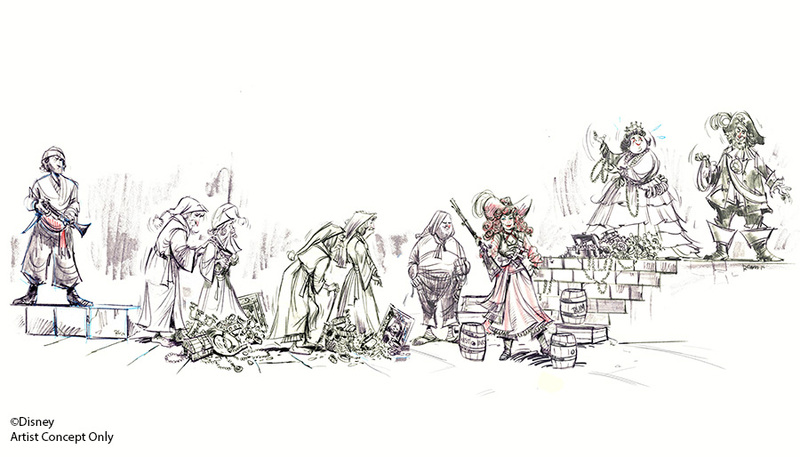 Guests will now see her joining the pirates’ ranks and helping the locals “unload” their valuables at the Mercado auction. Disneyland Paris guests will also discover some changes to the Blue Lagoon Restaurant, re-opening as Captain Jack’s. It seems that Captain Jack won the restaurant in a wager and is now welcoming pirates of all ages to relax over a drink and hot meal. The interior of the restaurant has been re-themed and the establishment has been staffed with a fun-loving band of pirates. The adventures set sail on July 24 in Adventureland at Disneyland Paris. Disney will be testing revised park closing times on Magic Kingdom Party nights this year in an attempt to improve the arrival experience for party guests. According to multiple sources, on nights when the Magic Kingdom is hosting Mickey’s Very Merry Christmas Party, the park will close this year at 6 PM to day guests. The party will begin as normal at 7 PM, but only guests with tickets to the party will be able to ride attractions after 6 PM. Day guests will still be able to shop and dine until 7 PM however. Mickey’s Not So Scary Halloween Party has not announced the use of revised hours as of yet, and is scheduled to close at 7 PM for day guests. 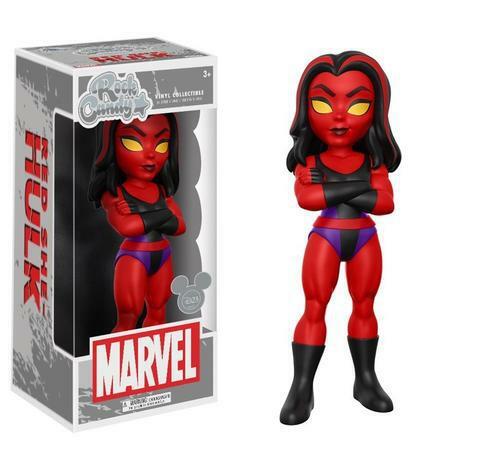 Funko will be formally attending Disney’s D23 Expo for the first time this year, and of course they’re coming armed with plenty of great exclusives. 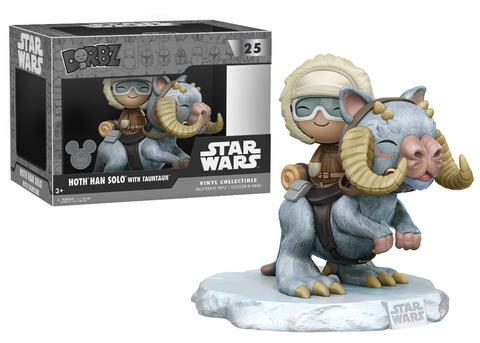 Today, Funko revealed their D23 Expo exclusives, which include two fantastically cute Star Wars Dorbz sets. Funko will also have a booth to show off their collectible subscription service “Disney Treasures.” Past boxes will be available for sale at the booth as well as new subscriptions. The D23 Expo 2017 returns to the Anaheim Convention Center from July 14-16 across the street from Disneyland Resort. This Ultimate Disney Fan Event brings together all the worlds of Disney under one roof for three packed days of presentations, pavilions, experiences, concerts, and sneak peeks. Today, D23 is giving a first look at products coming to the Disney Dream Store, the spot to find Disney Parks-inspired apparel, art, collectibles and much more. 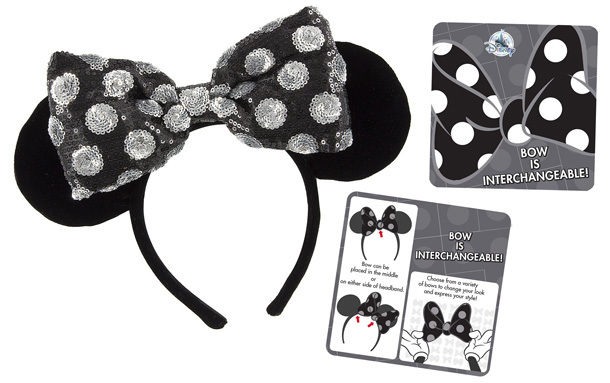 To start your headband collection, you will need the mouse-eared headband that comes with a removable sequin-covered bow. This starter headband contains three spaces where an interchangeable bow can be attached using a clip. 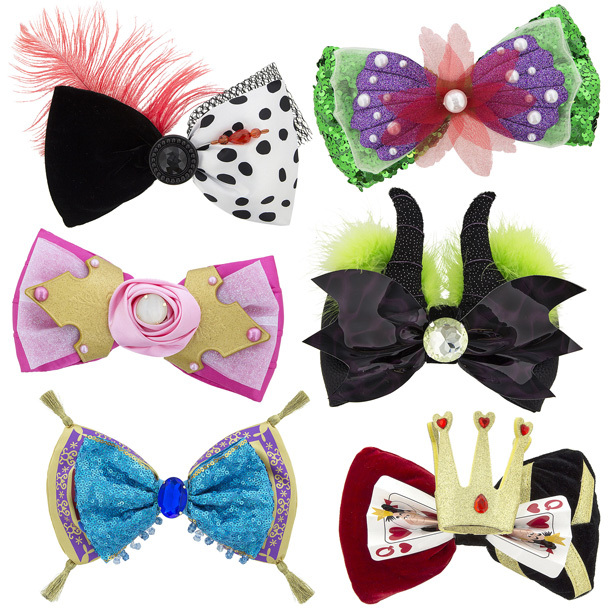 Guests will also find six Disney character-inspired bows sold separately, which can be easily attached to the starter headband. Jeanne told me there will be 10 specially designed bows available when the collection is officially released this fall at Disney Parks. Finally, Jeanne shared with me a limited edition, genuine leather hat that celebrates the 50th Anniversary of the Pirates of the Caribbean attraction. 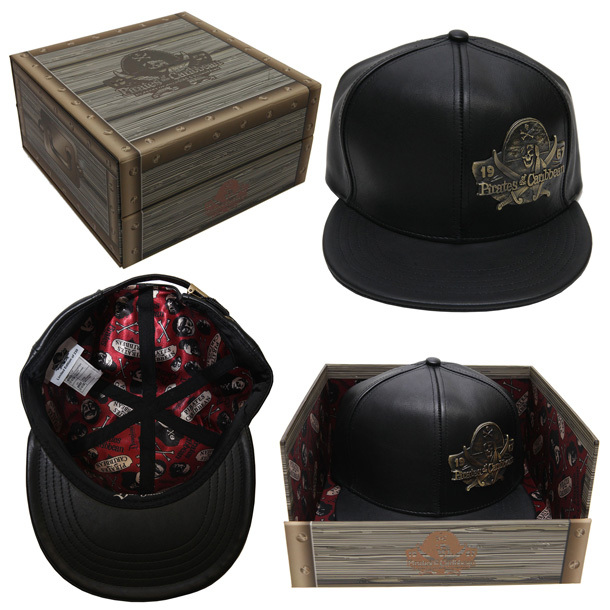 Presented in a decorative treasure box, this hat will contain a pirate-themed metal medallion, and will have an edition size of 230. It’s the perfect hat to wear when visiting the Walt Disney Archives Exhibit, “A Pirate’s Life for Me: Disney’s Rascals, Scoundrels and Really Bad Eggs,” at the D23 Expo this year. Stay tuned in the coming weeks for additional looks at commemorative products coming to the Disney Dream Store. 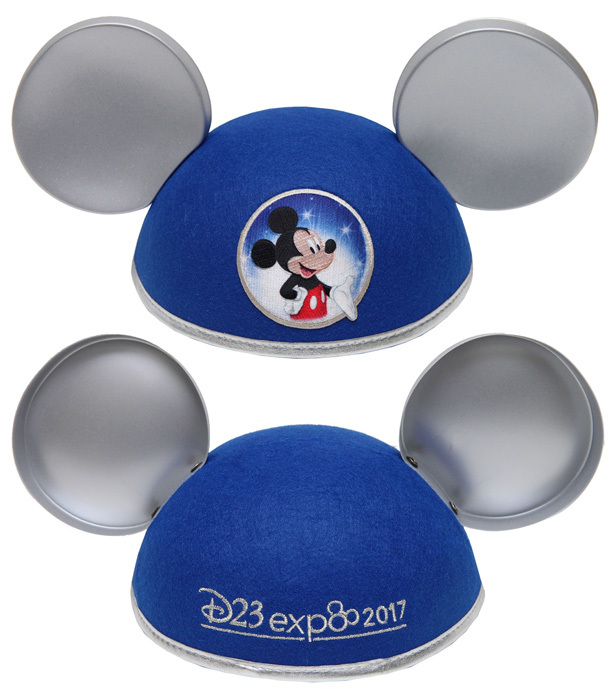 You can also discover the latest D23 Expo 2017 news by visiting D23expo.com. At D23 Expo 2015, we met the cast of Star Wars: The Force Awakens at The Walt Disney Studios live-action panel, were the first to hear new details about Toy Story 4 at the Pixar and Walt Disney Animation Panel, and were thrilled by so much more throughout the three-day event. These two can’t-miss panels are back for D23 Expo 2017, along with new presentations that will bring some of your favorite characters and films to life in a whole new way. Take a look at the schedule below and get ready for D23 Expo! Pixar and Walt Disney Animation Studios: The Upcoming Films, Hosted by John Lasseter (2:30 p.m., Hall D23) –– Join host John Lasseter, chief creative officer of Pixar and Walt Disney Animation Studios, as he shares never-before-seen footage from Pixar’s upcoming feature Coco and Walt Disney Animation Studios’ Ralph Breaks the Internet: Wreck-It Ralph 2. Plus, surprise announcements, musical performances, and appearances by star voice talent. Cell phones, cameras, and all recording devices will be checked for this presentation. Disney, Marvel Studios & Lucasfilm – Live Action at The Walt Disney Studios (10 a.m., Hall D23)–– At this exclusive Hall D23 presentation featuring never-before-seen footage, surprise star appearances, and more, you’ll get a behind-the-scenes glimpse at an exciting array of spectacular films on the horizon from these world-class studios. Cell phones, cameras, and all recording devices will be checked for this presentation. The Power of the Princess (10:30 a.m., Stage 28)––Join Jodi Benson (Ariel), Paige O’Hara (Belle), Anika Noni Rose (Tiana), and Auli‘i Cravalho (Moana) as they share stories from the making of these iconic films and how these characters have impacted fans across the globe. Hosted by Walt Disney Animation Studios animators Amy Smeed and Kira Lehtomaki. Olaf’s Frozen Adventure: A Sneak Peek at the New Frozen Short Film (2:30 p.m., Stage 28) –– Be among the first to see exclusive and behind-the-scenes footage from Walt Disney Animation Studios’ newest Frozen holiday short film event, the highly anticipated Olaf’s Frozen Adventure. The film, which features the talents of the original Frozen cast, as well as brand-new songs, is directed by the Emmy®-winning team Stevie Wermers-Skelton and Kevin Deters (Prep & Landing) and produced by Oscar®-winning producer Roy Conli (Big Hero 6, Tangled). The Evolution of Pixar’s Characters (6 p.m., Stage 28) –– Pixar characters are full of personality––from the waves in their hair to the shoes on their feet. Join some of the legendary Pixar artists behind its most memorable characters as they share what it’s like to draw these lovable characters to life. Celebration of an Animated Classic: The Lion King (10 a.m., D23 Expo Arena) –– Join a Disney celebration of the magic, the music, and the majesty of the animated classic The Lion King. Producer Don Hahn, director Rob Minkoff, and animators Tony Bancroft and Mark Henn, along with some very special guests, reveal the secrets behind the making of the timeless animated classic. Bambi’s 75th Anniversary (11:30 a.m., Walt Disney Archives Stage) –– Celebrate the 75th anniversary and Walt Disney Signature Collection release of Bambi with personal stories from the voice cast, anecdotes behind the making of this film and its exquisite hand-drawn artwork, and much, much more. Pixar and Walt Disney Animation Studios once again join forces for a must-see animation experience at D23 Expo. Don’t miss artist demonstrations, autograph signings with top filmmakers, fan giveaways and interactive displays featuring the latest films including Cars 3, Coco, Olaf’s Frozen Adventure, and Ralph Breaks the Internet: Wreck-It Ralph 2. At the Marvel Studios Pavilion, fans will get an up-close look at the costumes and props from Thor: Ragnarok, including photo opportunities with exclusive set pieces from the film, as well as incredible costumes from Black Panther. Marvel Studios will host multiple giveaways and events within its pavilion space in Hall B. Fans will get the chance to meet with Marvel Studios’ filmmakers, development team, and talent. Exclusive artwork will be given away daily, along with other surprises. Details on talent appearances and special signings will be made available on the D23 Expo app. Over the three-day Ultimate Disney Fan Event, the Disney Music Emporium will feature album signings by artists and award-winning composers. Limited quantities of a wide assortment of music products will be available, including new releases from Marvel, Moana, Beauty and the Beast, and Disneyland attraction picture discs, plus lithographs, Crosley turntables, and posters. For a complete list of talent appearances and album signings, visit http://waltdisneyrecords.com/d23expo/signings.html. Disney fans will be able to experience a unique augmented reality photo booth presented by Disney Movie Rewards. Fans will be able to earn mystery points which can be used for great rewards like Blu-rays, movie tickets, and exclusive collectibles only available at DisneyMovieRewards.com. Disney Movie Club, the ultimate source for building your Disney movie library, will also be there hosting a special augmented reality gallery. Come by for free giveaways and a special sign up offer just for D23 Expo 2017 attendees. Stop by the Disney Family Movies booth in Hall C to learn about this fun subscription, video-on-demand service. Sending some snail mail? Make your mark with the Disney Villains Forever stamps, a celebration of the historic Walt Disney Studios Ink & Paint Department. The collection highlights 10 classic villains, from The Queen from Snow White and the Seven Dwarfs to The Lion King’s Scar. The U.S. Postal Service will dedicate these delightfully devilish stamps at D23 Expo 2017, on July 15 at 1:30 p.m. at Center Stage. Plus, the collection will be available for purchase following the dedication! Take a look at the collection below, and stay tuned for more D23 Expo updates!